A photo showing the missing Argentine submarine departing on its final voyage on Nov. 13 has emerged almost three weeks after the submarine disappeared. The photo, which was tweeted by a Falkland Islands account, shows the ARA San Juan dipping into the water’s surface after it left the port for the final time, reported Daily Mail. According to the newspaper, the photograph was taken from the Aerolineas Argentinas 737 flight near Ushuaia, at the country’s southerly tip. The Argentinian submarine was traveling in the South Atlantic with a crew of 44 and last transmitted a signal on Nov. 15. The search for the vessel was called off by the Argentine Navy on Nov. 30 after all hope of finding the crew alive faded. Experts said the crew only had sufficient oxygen to last 7 to 10 days. The captain later reported that the incident had been contained by sailing using an alternative battery circuit, according to an Argentine spokesperson. 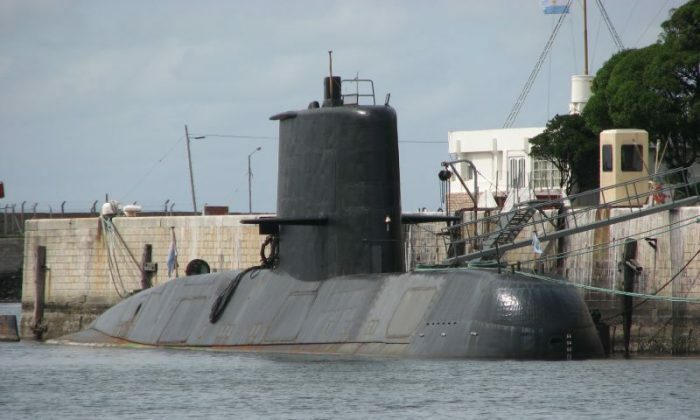 The Argentine Navy had reported that an explosion was detected in the location where the submarine had vanished from. The crew’s families were informed that all aboard were dead following the explosion, which occurred 600 to 3,000 feet under water. Families of the Argentine submarine crew are demanding that Argentina’s navy reverses its decision to stop looking for survivors, reported the Daily Mail. “We’ve had 28 ships, nine aircraft, 4,000 people involved, 18 countries supporting,” Captain Enrique Balbi, a spokesperson for the Argentine Navy, told reporters in a press conference on Nov. 30. “Despite the magnitude of these efforts, we’ve been unable to find the submarine,” he added. The Argentine Navy said it no longer considers the search a rescue mission but is willing to continue looking for the missing submarine and recover the wreckage of the vessel. Ships from the United States and Russia will join the other five vessels from Argentina and Chile to search an area of about 1,500 square miles (4,000 square kilometers), where sonar detected three unidentified objects on the seabed. Balbi said that Russian ship Yantar, an oceanographic research ship, arrived on Dec. 5 while the American ship, U.S. Atlantis, will arrive a few days later on Saturday. These ships are equipped with deep submergence vehicles that allow them to examine undersea areas nearly 20,000 feet deep (6,000 meters), reported the Daily Mail.